This thing is looking a lot like an upturned animal with it's stumpy feet in the air! The "feet" are sandboxes on supports. Fiddly to assemble, there are cut-outs in the bottom of each part that I don't think should be there as the sand would leak out. Worse, they weaken the soldered joints. Much of the detail has been attached with solder paste and a RSU. I like using the resistance tool and should do more with it. The paste is less fun as the leftover, on this uncleaned model, is dark grey and not a pretty silver. Lost wax details are a nice touch but they really need to be polished in some way after fitting. 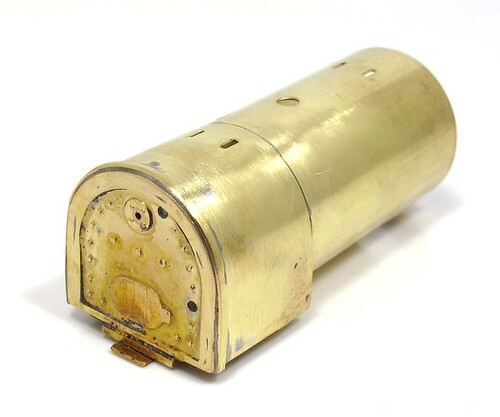 I have a small sandblaster that I'll use on this to see if I can clean the solder and cast brass surfaces. If you ever find yourself planning a little shopping in Birmingham's famous jewelery quarter, don't get an early train as many of the shops don't open until after 10am. Arrive at 9:05 and you'll need to entertain yourself for a while. After a sausage sandwich in a corner cafe, I took a stroll looking at the buildings. There's much to enjoy and my favourite was Pickering & Mayell Ltd. Set up to produce packaging materials (boxes etc.) for the local firms, they sold out to the Talbots group in 1981. 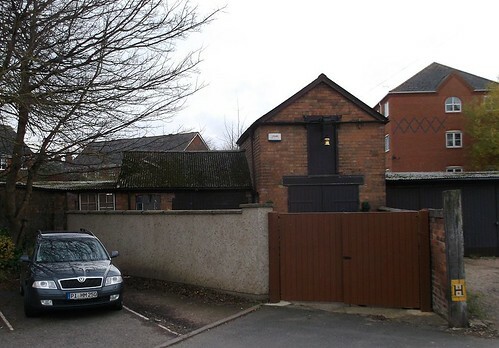 A few years later, the group "changed direction" and in 2012 the original premises were no longer suitable, the business moving to Princip Street, 5 minutes away. 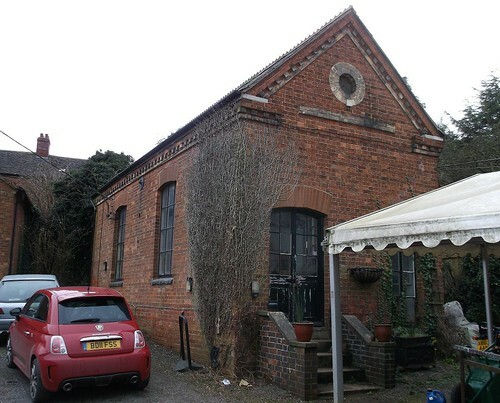 Manufactory, formerly a pair of dwellings with rear workshop ranges. Early C19. 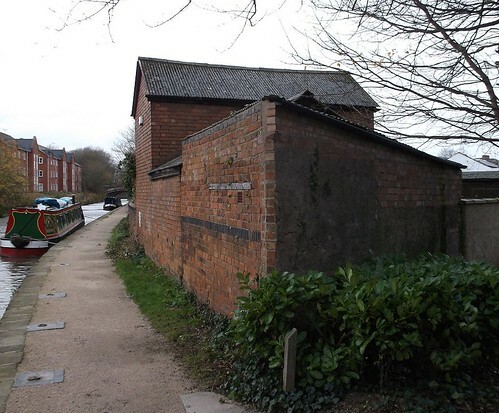 MATERIALS: Red brick with bracketed eaves to a hipped slate roof and plain band corniced chimneys. PLAN: Rectangular plan comprising a pair of former dwellings with workshop ranges extending to the rear. EXTERIOR: Near-symmetrical three-storeyed frontage of four bays onto Caroline Street. The fenestration consists of revealed sash windows, some of which retain their glazing bars. The ground and first floor window openings have painted stone sills and reeded lintels flanked by shallow consoles to thin cornices over. The entrance is sited in the second bay from the left. The door case has engaged, slender, fluted Greek Doric columns which support an entablature and open bracketed pediment. There are plain reveals to the round-headed doorway and a six-panel door with a plain fanlight. 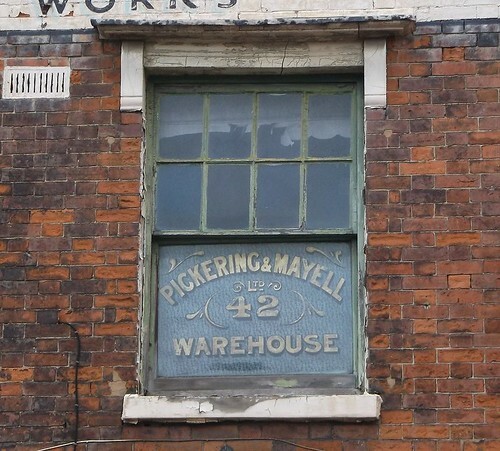 A panel above the first floor windows reads `PICKERING & MAYELL LTD / RELIANCE WORKS'. The north return (Kenyon Street) of the attached workshop ranges which extend from the rear of both houses retain some original wooden-framed multi-pane windows. 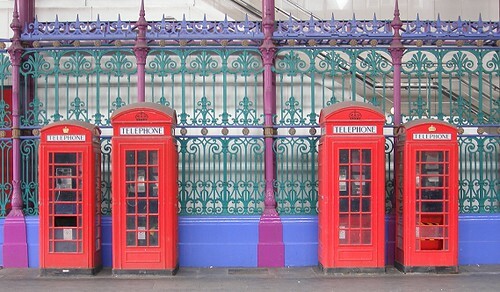 SUBSIDIARY FEATURES: To the front (west) are cast-iron railings with crescent heads of distinctive Birmingham type. 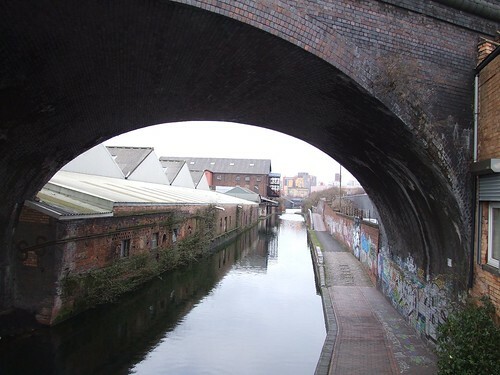 HISTORY: The area around St Paul's Square to the north west of the city centre was developed as a residential and industrial zone from the 1820s and was eventually to become the Jewellery Quarter. 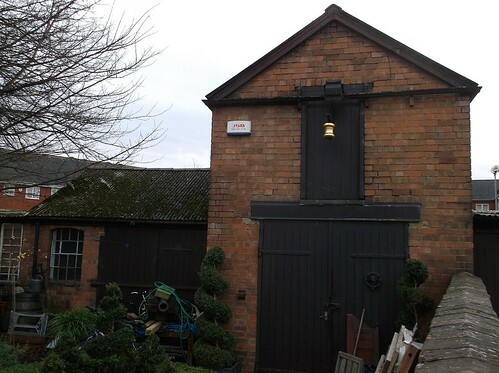 The jewellery-case-making works of Pickering and Mayell Ltd, known as Reliance Works, was built in around 1826, originally as a pair of houses (Nos.41-42) with rear workshops. Early occupants included the noted Birmingham silversmiths George Unite and Nathaniel Mills. 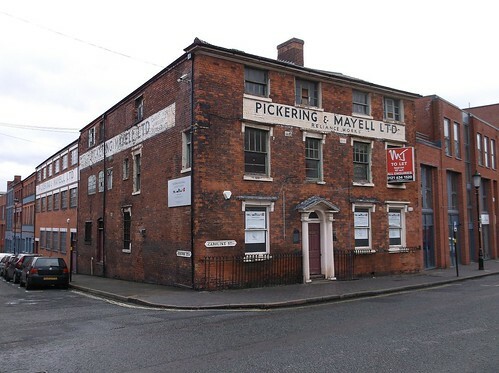 The company of Pickering and Mayell has occupied the premises since circa 1900. I'm not the only one who appreciates the building, Shopfront Elergy has covered it as well. You might also be interested to read more on the Talbot Group which includes a little history. 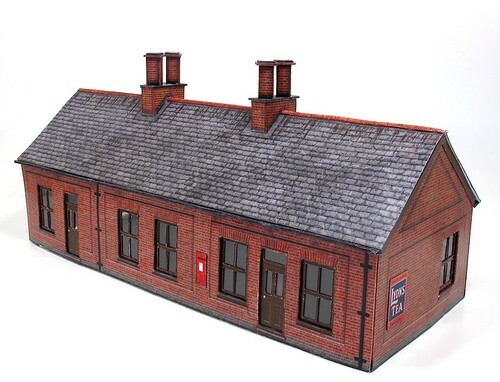 From a modellers perspective, the front door could be out of a Wills Building parts pack and the window lintels wouldn't hard to make. The extension to the factory in a very different brick is a useful feature too. We tend to model buildings as though they appear fully formed but in real life, they grow as required and those changes are part of the visible history and character. A couple of hours soldering and cleaning up - the boiler basics are together. Both barrel and firebox are pre-formed. The former only needs it's bottom seam soldering and it's ready to go. The firebox is a bit trickier. 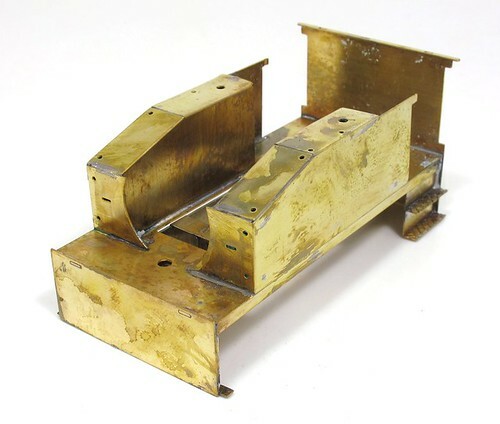 A two-layer backhead is built up first leaving an edge the thickness of the brass around the outside. The wrapper fits into this, more by luck than judgement as it's all done my eye. Then the instructions call for a length of 2mm wide scrap etch to be soldered around the back edge and polished. Calls to use scrap material for something as important as this are rare. You are asked for the odd packing piece or filler, but a visible part? Good job there is a suitable part on the fret and to be fair, it's better than wasting metal. Fitting the inner tank sides to the Barclay is easy - tabs and slots sort out the location, although there is a quite a lot of slop so you need to pick which side of the slot your tab should fit and then do the same on the other side. Outer sides, well they seem a fraction large. I managed to persuade them to fit inside the inners as shown in the instructions but I really could have done to shave a fraction off the front and top edges. I'll check for flatness across the tank tops and might file a little meat out of the brass if they look like they need it. First impressions are that I'll get away with it but then I'm working by eye. Those who know me, appreciate that I like a funny Christmas present. No expensive parcels for me, give me something silly, preferably in pieces for me to build after lunch. So, among all the chocolates, books and handkerchiefs, I find a set of Guinness World Record model aeroplane kits. According to the box, if I build these and practise enough, I could get my name in the record books for both flight duration and accuracy. 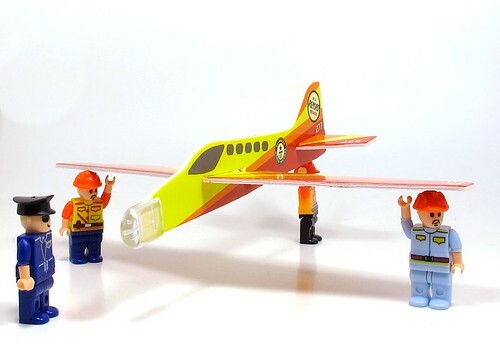 Mind you, I've built the first plane and no matter which nose weight I fit, it flies about as well as a breezeblock but no-one said record breaking was easy! Another gift was a set of "rip-off Lego" minifigures. You can tell they are "compatibles" rather than the real thing as the plastic is bit rubbery and light. Rather disconcertingly, a couple of them appear to be wearing minimal clothes too. I'm thinking they will be appearing as assistants in a few future posts, but only the clothed ones! An upgrade to the usual crackers at lunchtime saw me score a more useful than average gift. 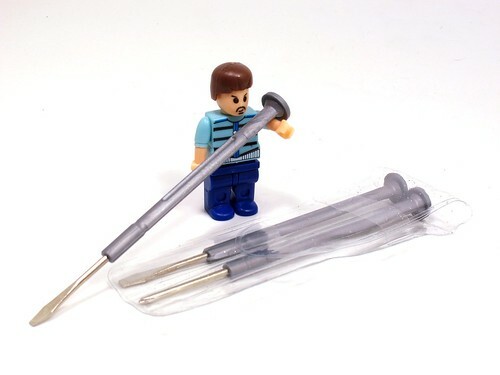 Some little screwdrivers. Amazingly it IS possible to find jewelers screwdrivers cheaper than the £1.99 packs on sale at your average market! While I know these will be of rubbish quality, the handles will break the moment you try to undo a screw with them, as poking tools, they will be fine. And I have the fun knowing they came out of a cracker. I wonder if we spent a bit more money I'd get a resistance soldering outfit? It's Boxing Day in the UK. To celebrate this, I searched on the word "Box" in my Flickr photos. 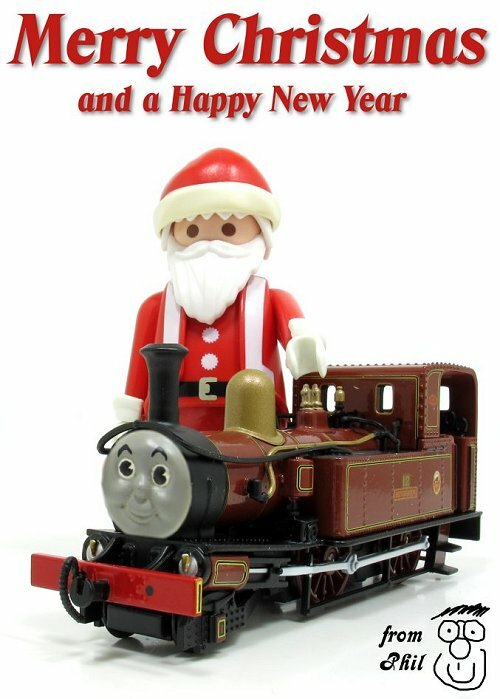 Merry Christmas and Happy New Year to all readers of Phil's Workbench. I hope you've all been presented with some lovely model making goodies and maybe a little chocolate to enjoy whilst making them. A couple of hours with the soldering tools followed by some cleaning and burnishing, and the Barclay footplate is built. Work starts (for me at least) with valances located in half-etched lines along each side of the footplate. Then the honking great big buffer beams are fitted using tabs and slots. When I visited Barby Model Rail last week, I couldn't resist taking a few photos of the canal side buildings. Click on the pictures for a larger image over on Flickr. I'm not convinced that these buildings were warehouses, the one nearest the camera claims to be the Blacksmith's shop, as the place has been gentrified a bit. Is that derrick in the right place for example? The dry dock particularly interested me as I don't recall seeing one on a canal before. Boats seem to be hauled out of the water for work rather than taking the water away, but then I suppose cranes are cheaper than dry docks. 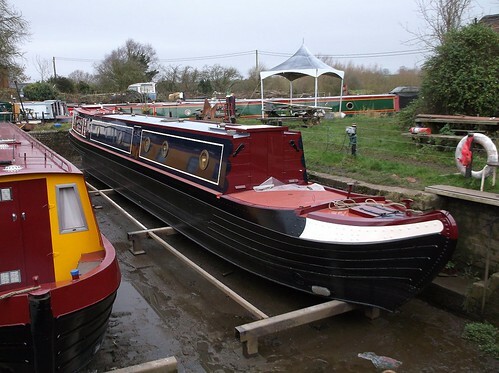 These should help anyone wondering what narrow boats look like below the waterline. Talking of water, the dam used to keep the dock dry was worth a look too. An aerial view is available on Google. Does this chassis belong to something else? Reading the instructions for a change, I was a little surprised to be told to hack the "wings" from the Barclay chassis with a saw. 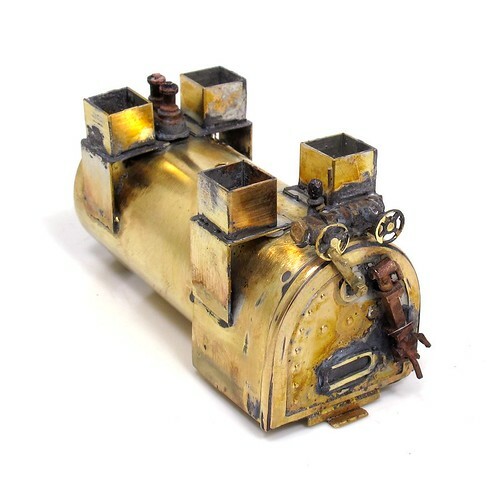 I'd assumed that these were the buffer beams - I'd even punched the etched rivet dimples - but apparently not. They are surplus to requirements. I wonder if the chassis kit was designed for something else and then pressed into service for this loco? Working on the Barclay kit, I've found my soldering iron a bit lacking in oomph. I think it's letting me that a new bit is required as the metal parts aren't that large, for a 45W iron anyway. No worries, I have a small gas torch on the bench. 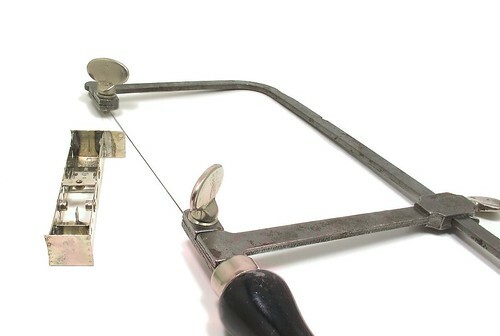 This handy tool is great for heating up localised areas and blowing solder along joins. The gas reservoir was empty but I quick fill with some Swan lighter gas sorted this, or so I though. Trying to light the flame on a cheapo cigarette lighter, there was noise but no ignition. The torch being empty had filled with air. 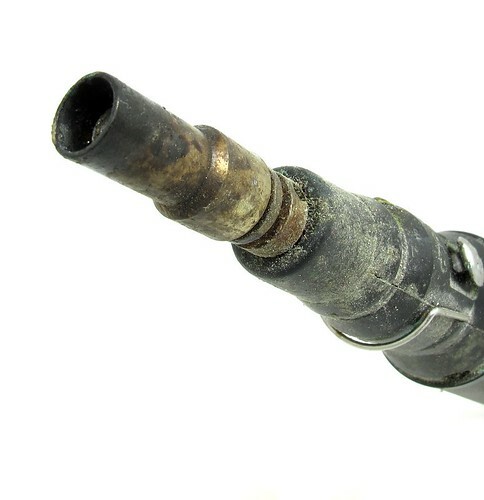 After around 4 minutes, I'd blown this through and started firing on proper, flammable, gas. Longer than I had expected certainly and worth bearing in mind if you find yourself in the same situation. On a forum recently, someone was bemoaning the pages given over in a magazine to prototype photos. Apparently, these are a waste of space because he can get all the pictures he needs on the Internet. This is of course, rubbish. Yes there are a lot of photos on the web but you can't beat having access to a library full of real books. I've been building a wagon kit and needed some end detail. Was there a photo on the web? No. But I found the information in a book that I paid 6 quid for years ago. There were some really nice shots of the brake gear too. 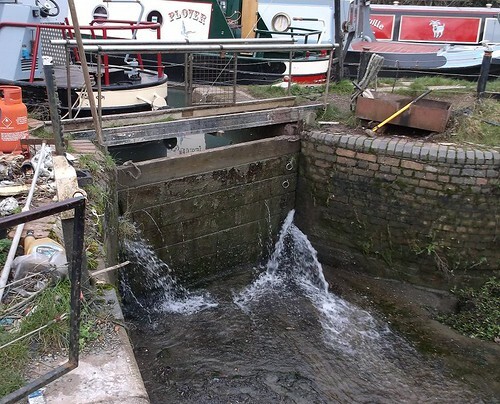 It's a little off the beaten track, but once you get there, for canal enthusiasts there is a lot worth seeing. 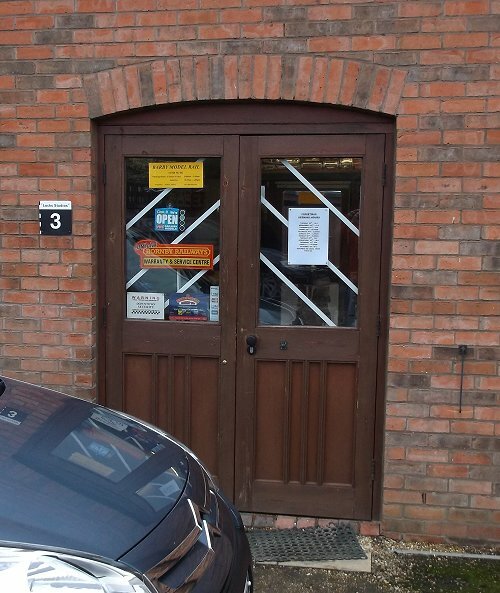 The shop entrance is low-key but once inside, it opens up into a veritable model railway Aladdin's cave. 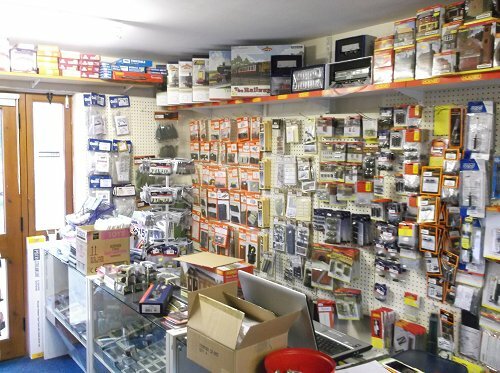 On the left, a wall of Wills kits and bits'n'pieces. Owner Tony French wasn't convinced by these when he took the business on but the sales have justified their retention. Under the test track on the left there are many packs of the same companies building materials as well as Slater's Plasticard. 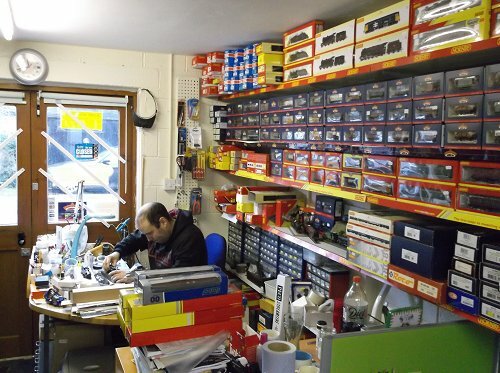 Behind the repairs bench is a huge selection of new and second hand RTR models, both locos and rolling stock. 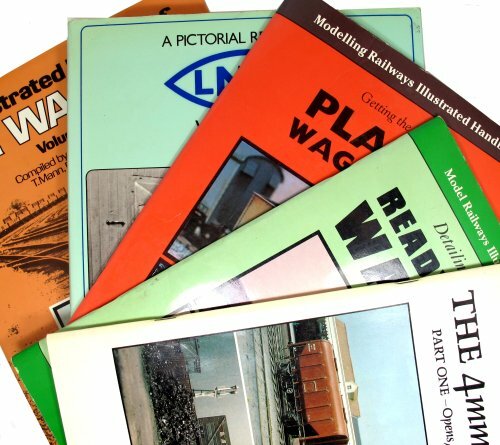 Hornby, Bachmann, Dapol and Oxford Rail are in stock. By the door, a display case shows some of the new models but there's more on the shelves. Stock is mainly OO but with a few bits of N and O. 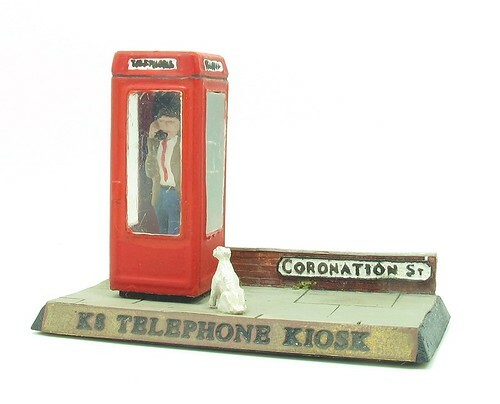 Others scales can be ordered in - one of the assistants is a 7mm modeller and while I was there picked up some Parkside kits to go with his recently purchased Dapol Terrier. Although Tony only took over the business a few months ago, the shop has been open for longer and so there are a few gems to be found if you dig. 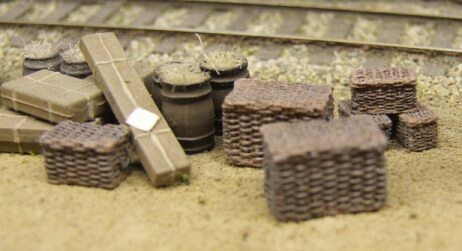 I was also pleased to see the best range of Merit models, often overlooked but very useful for anyone building a layout. 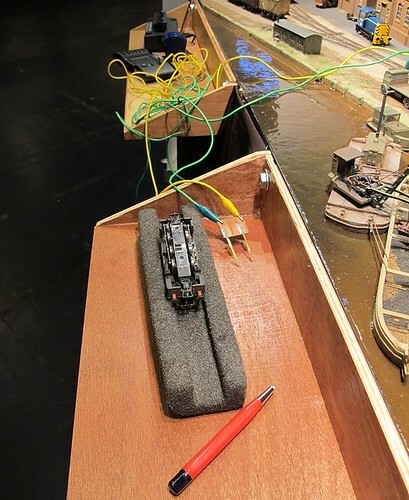 As befits model shop that isn't just shifting boxes, services such as DCC decoder fitting are offered and buyers can see models work on the test track. Considering the location, the shop was busy too. In a couple of hours mid-week there were half a dozen buyers as what should be a really quiet time of year. 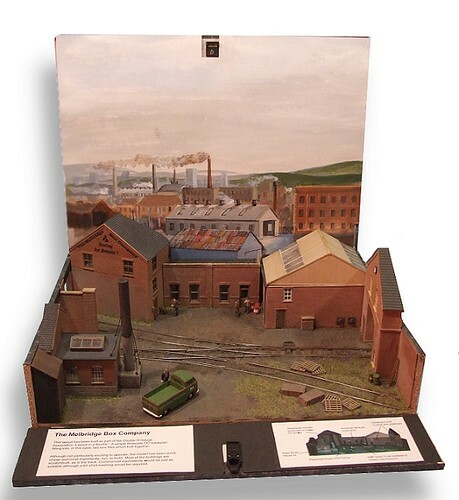 In the summer, when the cafe is open and you can leave the family in the sunshine by the waterway, it would make an ideal location to "accidentally" visit, the rest of the time, it's a good, solid useful model shop. 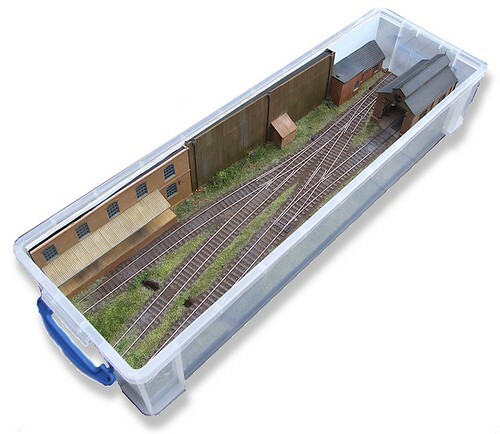 More details on the Barby Model Rail website. No idea how long it took to get me this far but no more than a couple of hours. The chassis sides fold up and thanks to some nice tab and slots design, everything locates reasonably accurately in place. The slots are perhaps a little larger than perfect so some care is required to make sure everything lines up. 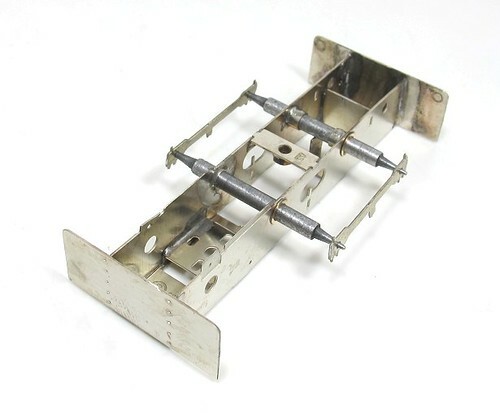 Aluminium axle jigs aid the positioning of the bearings. Two lengths of these are supplied with the short ones for the gearbox end and the long ones in the other holes. I'm intrigued by this as there is a support for the centre of the axle which would normally indicate it rocks to compensate for uneven track. The long bearings would seem to make this less likely though. We'll have to wait and see. 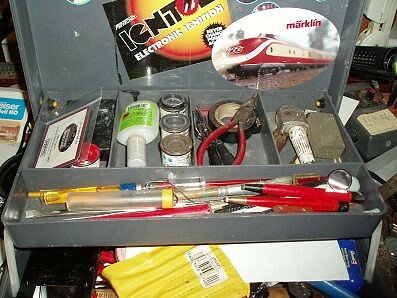 I've an etched loco kit project lined up for the very near future and since the last one I built was quite a while ago, I thought I'd better get a bit of practise in with the soldering iron. 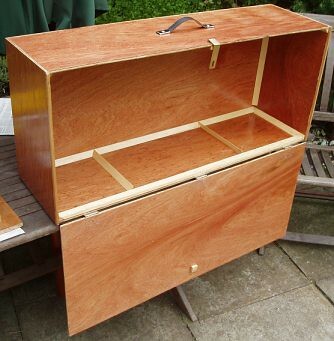 And I'd had this kit kicking around for many, many years and just fancied getting it built. Branchlines 0-4-0T "Peacock" for O16.5 isn't a real loco. 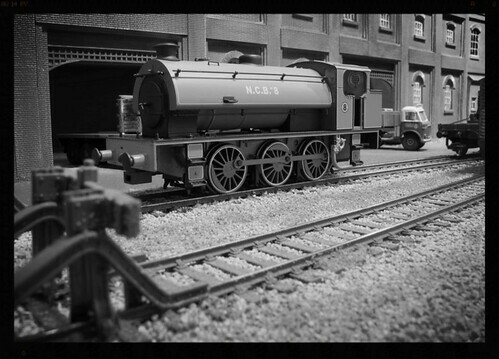 The prototype it's based on was from the Beckton Gasworks system, which as you'll probably know, was standard gauge. There is a nice photo of the loco nearest this design here. 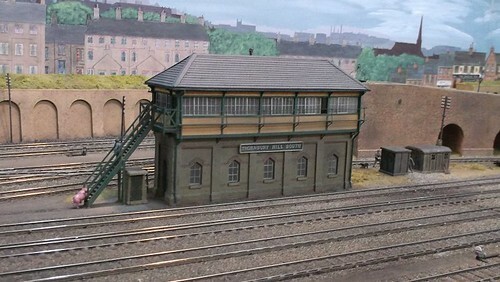 The designer of this model took inspiration from Chris Peacock's layout "Calstock Quay" which features some scratchbuilt versions. 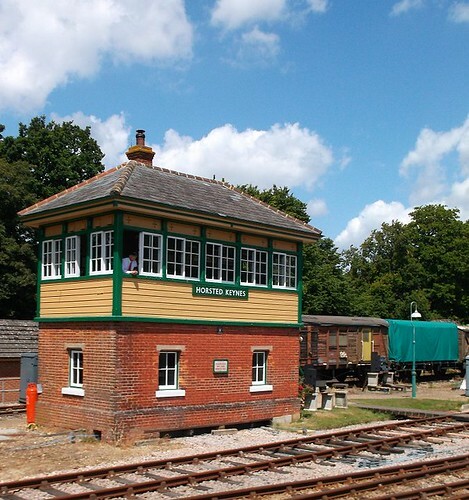 They have used the standard gauge loco as a guide and scaled the proportions down to suit a narrow gauge model. In the box, bought from Motor City Books in Oxford when it existed, contains lots of etched bits, some whitemetal and lost-wax cast brass. Romford wheels and a Tenshodo motor finish the package. I paid a long forgotten bargain price for this but think the kit is still available from Branchlines. First impressions are good - the etched bits are cleanly done. We get brass and nickel silver. The cast brass parts are sharp, as are the whitemetal. Several pages of instructions are in the modest (too small for the finisehed model) box and include exploded diargams for those who can't be bothered to read. A few weeks ago, I took a walk around the north end of Leamington Spa looking at old workshops that might make useful models filling in odd corners of a layout. Now, I've been in the south of the town to find this little scene trapped between a Co-op car park and the canal. The site is triangular, crammed into the space available. Next door is another angular site, this time full of garages. I'm assuming from all the doors that this really was a warehouse of some sort. It's a tiny building though and could probably be modelled to scale. It reminds me quite a lot of one of Iain Robinson's drawings from Railway Modeller years ago - that sort of atmosphere with "stuff" that has grown up over time. You can see the site on Google Streetview. 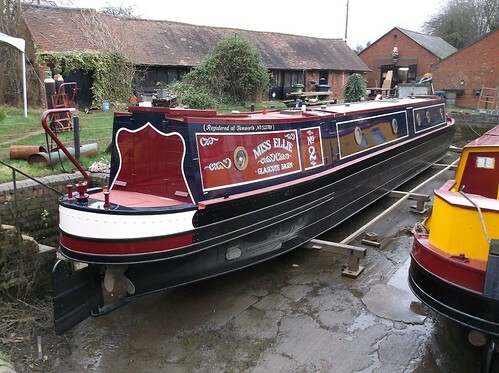 It might seem odd for someone who has recently built a Bantam Tugboat, but I've never felt that canal boats are good subjects for large, radio control models. They are at home in narrow waterways but look wrong to me when on a lake. A really short prototype, not much longer than the Bantam. 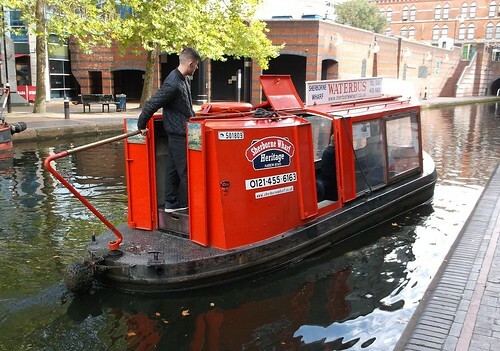 It is a little boat on the canal so wouldn't have that "fish out of water" feel when on a lake. 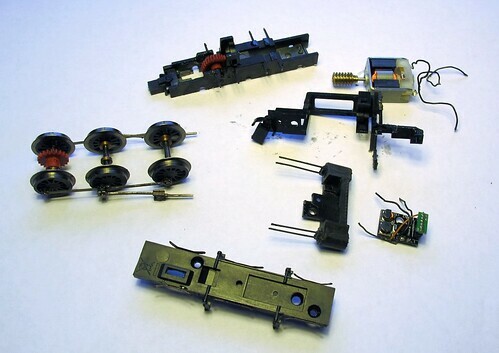 I'd suggest that any model needs to be at least 1/12th scale to fit the mechanical bits. Going even bigger might be nice, perhaps Action Man size? If you want to sail, details here. I don't like things I can't repair. One pet hate is those stupid plastics that don't react to any known glue so once broken, can only head towards land-fill. Another issue is shoes. Occasionally, the sole starts to come unstuck from the top and needs a little glue to fix the join. It was glued originally so repair ought to be easy. Trouble is, the join has to flex. You can't use epoxy as it's too stiff and after a few feet of walking, starts to break down. Evo Stick, being a rubber glue, ought to be better but never seems strong enough to me. I'll confess that I've even had failures when having repairs professionally carried out. New soles pulling away from perfectly good uppers for example. A while ago, I bought a tube of Unibond EXTREME glue. It claims strength and flexibility so I gave it a go. I can report that on one pear of shoes, the join, at the toe, was effective and allowed me to cover many more miles before I wore the soles out. 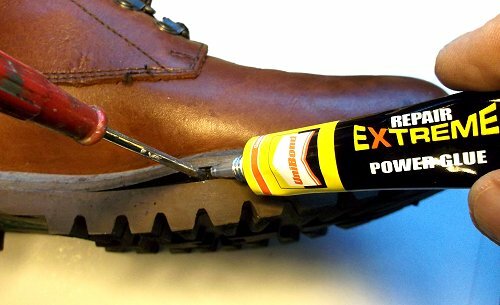 More recently, it's been used to re-fix a boot sole which shows no evidence of glue being involved in the manufacture and this seems OK.
Two tricks: Open the gap with a screwdriver so you can squirt the glue well into the join. Second, a paper towel dampened with white spirit wipes away splurges of glue from the sides, leaving a perfect join. Spotted on Facebook, this is captivating. As far as I can tell, the guy really is making these models out of card - although it must be a very high quality one as it doesn't seem to bend much. The parts have been pre-printed but even so, cutting the things out (can't see any laser burns so this must have been done by hand) will have taken many, many hours. 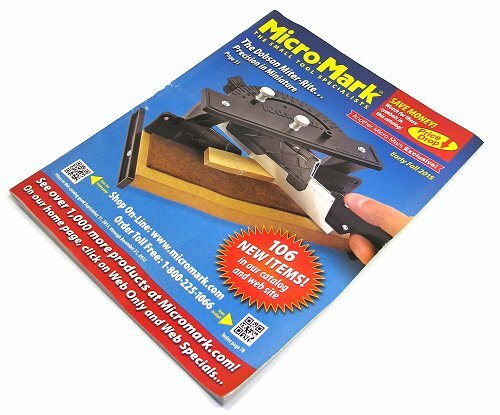 For various MREmag related reasons, I find myself in possession of a Micro-Mark tool catalogue from the US of A.
I've perused the website a few times but there is something about seeing a the amazing selection on tools in a paper catalogue that is special. And horribly tempting to a tool freak like me. On every page there is something that I would find useful, or at least interesting. Looking closely, many of the items are available in the UK and quite a lot of them are in my possession already, but there are some funky clamps in page 41 for a start. Trouble is that while the prices are good, postage from the USA costs a million billion pounds. That and some of the chemicals can't be shipped out of the country anyway. I've often thought that if I ever win the lottery, I'm going to pick up a catalogue, ring the number and order one of everything. It might well be this one. If you are as stupid as me, you don't always pay attention when dismantling a model locomotive. 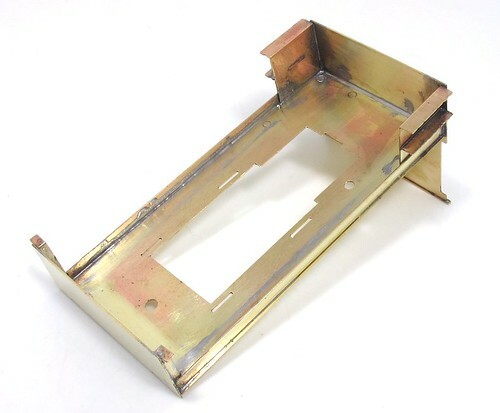 If the loco concerned is an Electrotren and you try to pull the baseplate off, you'll stretch the wires that pass up through the cast chassis. This allows the insulation to pull back and the positive and negative electric juice to escape, meeting each other in a sparky way that DCC controllers just don't like. 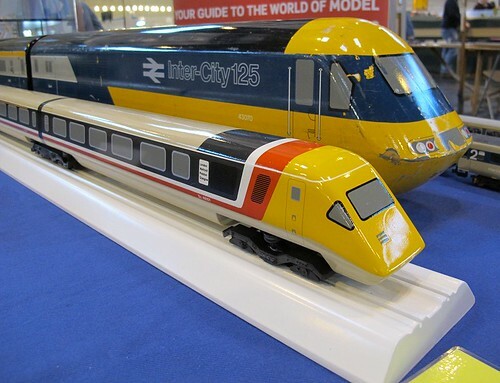 If you saw the model at Doncaster you'll know it wasn't running. For Warley I decided to fix it, partly prompted by the promise that the manufacturer of the resin body would be visiting. Anyway, I carefully unscrewed and unclipped everything with the results you see above. Apart from some fiddling popping the waggly bits back into the slide bars, it's not too bad a job. I rewired with the thinnest wire I had to hand and double insulated the exposed wire at the top of the pickups with blobs of superglue - just to be on the safe side. Once reassembled, the model runs sweeter than such a cheap chassis has any right to, especially one with such a cheap 3-pole motor. I've kit built chassis that don't work that well and they have "proper" motors in them. Grrrr. If you were loitering around the BRM stand at Warley, you'll have seen this issue already. Hard work by the production team and a printing press a short stroll from the office allowed the January issue to be available extra early. For everyone else it arrives this week. Construction couldn't be simpler. The resin body needs a little assembly, mainly fitting the handrails and a few other bits, and then it sits on an Electrotren RTR chassis. Result: a very sweet running model that really looks the part. For me, the biggest problem was finding something to fill the pages as the construction is so simple! For a change I've been able to go to town on painting and weathering. Modellers are always saying how much they want an industrial chuffer in wish lists. 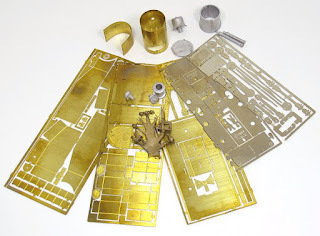 Well, here is a kit that anyone could assemble. It deserves to sell like hot cakes, as does the follow up Barclay on the same chassis. You don't get an easier way to watch a model loco run and feel the pride that only comes with having built it yourself. 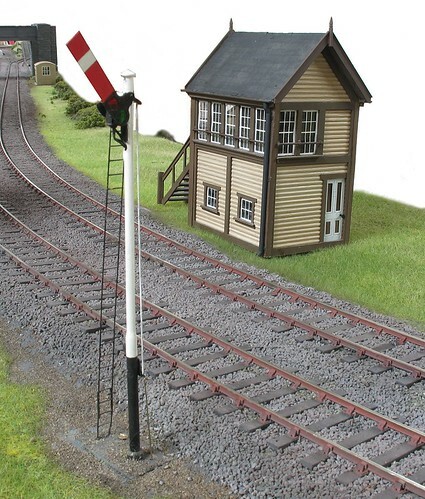 Another beginner-friendly feature is the free card kit designed by modelrailwayscenery.com. Modellers will find it on the DVD. I built a pre-production version and ended up requesting a few changes to the design but these should make the build even easier. The complete model appears over 4 months and the last one will be particularly useful even if you don't build the rest as it's some excellent posters and building details suitable for all sorts of models. 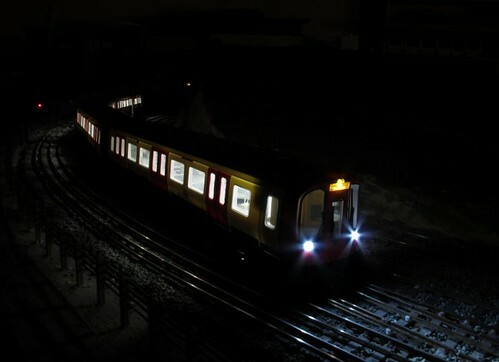 Finally, I've added some Train-Tech lights and sounds to the new Bachmann/LT museum S Stock. The hardest part of the job is taking the model apart, although the suggestion that the lighting bars be held in with Blu-Tack has quietly been ignored for better, bust just as easy, methods. Taking the final picture was fun. The lights and sounds are powered by internal batteries that detect motion to switch on. Built in lights on the front are powered from the track. Getting everything illuminated took best part of an hour. Eventually the driving bogies were set off the rails and then power applied. With wheels thrashing around uselessly, I managed to bag the required long exposure shots to complete the photo. Thanks to the L&WMRS Duxford team for letting me borrow the layout with all that lovely 4th rail for the background. 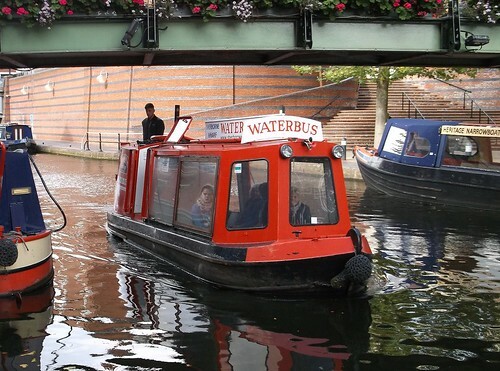 Today we are back in Birmingham, exploring the canals. For a change there are some actual warehouses in the photo, but I'm more interested in the building nearest the camera on the left. It appears to have been re-roofed with modern(ish) metal but the walls are a mass of tie plates. Not only do we have the relatively traditional S shaped plates, these are joined with lengths of what looks a bit like rail. The whole thing has presumably sagged quite badly over the years and someone decided that wrapping it in metal was cheaper than letting the thing fall down and rebuild. The condition must be pretty bad judging by the amount of plant life clinging to the walls. The roots digging in to the mortar won't be doing the structural integrity any good either. Maybe this is the Brummie equivalent of the hanging gardens of Babylon? August 1957: Local railway enthusiast Archebald Robotham sneaks his new Kodak Brownie Starlet into his snap bag and while partaking of lunch, take a photo of newly built a NCB Hunslet loco parked up in a siding at Ruston Quays. He wonders if one day someone will invent a colour film suitable for amateur use as he'd like to have captured the lovely apple green colour. The clean engine stands out amongst the dirt and grime of the dockyard he works in a a flange wrangler. 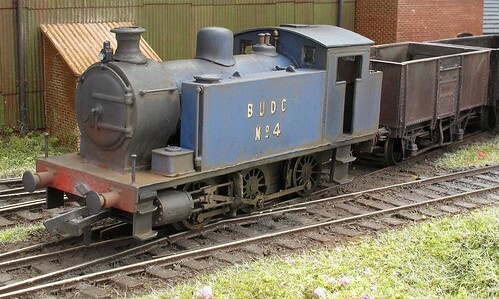 This is a DJ Models loco lent to us for photos during Warley exhibition. It is a pretty colour. Has anyone seen my lorry? One of the problems with exhibiting at that NEC is that when the show closes, everyone wants to get out at the same time. Setting up takes the best part of a day, knockdown, a few hours. The hall is big enough for vehicles to drive inside to pick up stands but as everyone wants to do this, there is a heck of a traffic jam formed pretty much as soon as the doors close. Despite parking in a "normal" car park (E1 I think), when I timed my walk to the stand, I reckoned it took something between 5 and 10 minutes. This meant a 20 minute round trip including unloading things in to the car. On that basis, I decided that I'd be quicker trolleying the layout to the car than trying to get the vehicle in the hall. I'd also avoid the frustrating time spent in traffic jams or touring the NEC road system that I'd experienced in previous years. A quick check by Ben at the end of the day told me the weather was windy but not wet. Worth the risk I thought. 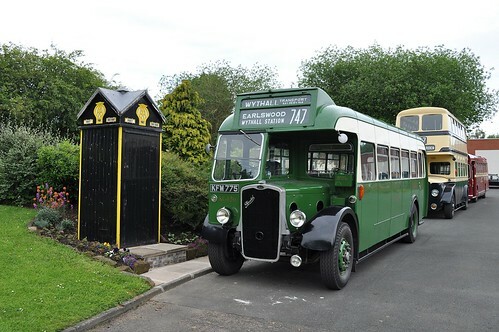 First trip took out the sideboards and legs with the trolley collected for the second trip. This saw me move the layout. After this there were the crates of stuff and finally the fascia panel and seat. One more trip than I bargained on but there were still a few people queueing in cars when I left so I might have saved myself some frustration. The best part was that if you leave at 18:50, the car park guys don't bother charging you for the parking so that's 12 quid saved. Setting up the layout on Monday to carry on working, I was pleased to see that everything was still attached. Except for the lorry. 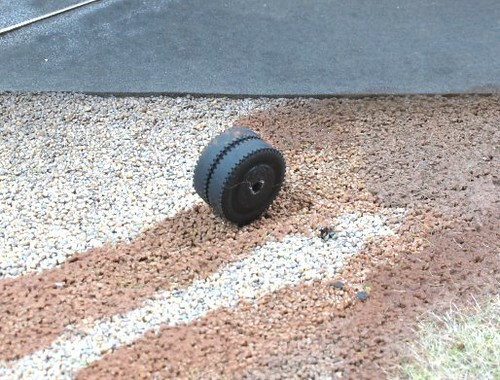 Sadly, only one wheel had survived the bumping along the roads and pavements. Presumably the rest of it ended it's days in an NEC car park. Regular readers will know this model as I showed it on here. Now I'll have to build another one. The Warley model railway exhibition at the NEC is the largest model railway exhibition in the UK. I spent the whole of last weekend there. And I saw almost none of it. My time was pretty much entirely spent behind, beside or generally around Ruston Quays talking to people. So many people. So, if you are expecting a full show report you will be disappointed. 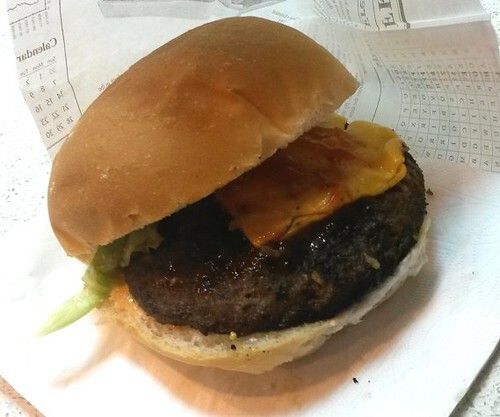 Truth is I could really do with a visit to a big model railway show to do some shopping but apart from a couple of very good burgers, a rather more awkward crepe (almost impossible to eat as the filling sunk into a pocket at the bottom of the folded pancake and was lava hot) and a Dapol canopy kit, my wallet was unbothered. Having said this, it was an excellent weekend. Lots and lots of people, including some readers of this blog, dropped by for a chat. Almost without exception, the chats were very nice too. People like what we are doing with BRM, the stuff I write and especially the DVD where my cunning plan not to share disk space with people really good at telly means my shortcomings are easily overlooked. Not everything is perfect of course. I do wonder about people sometimes when I'm asked, "Will this layout appear in the magazine?" and have to resist the urge to shout, "Yes. It's been in for the last 6 months and on the telly disk twice!" Best bits though are undoubtedly those where people tell me about projects they are doing because I wrote something in a magazine. 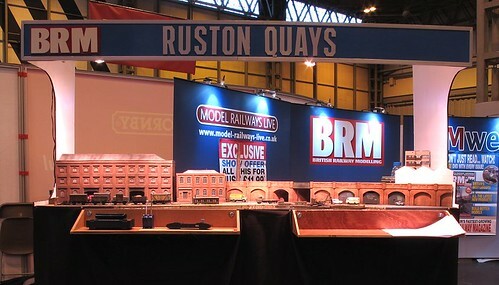 There's an O gauge version of Ruston Quays underway at the moment in addition to a couple of N gauge ones I knew about. This makes the job worthwhile, although if anyone from Warners is reading this, that doesn't mean you can stop paying me! Apart from this, there is little to say. Some van action saw the Bachmann display cases nearly filled with a full scale transit and Montana from Hornby resist the urge to run them over with another van while packing away. I can only assume they had all behaved themselves. New products, there were loads, but I took photos and put them up on MREmag for all to enjoy. Quite frankly, everything paled in comparison to the Oxford Diecast Manx Peacock for me but I might not be quite normal in that respect. My Saturday night plan to head to the airport rather than the station paid off. I had some yummy spag-bog and then strolled back for the trip back home whereas a friend who left at the same time managed to catch the same train having been unable to get on to the previous two as there was no space. Sunday night was more fun, but I'll talk about that tomorrow. In the meantime, can I just thank everyone who chatted for dropping by.